Barbecuing grassfed meat is actually simple and easy. This would surprise many people who have tried grilling a grassfed steak, only to have it turn out tough, but it is all in the technique. Grassfed meat is different from grain-fed meat and should be cooked differently. When you use the proper technique, it is easy to make it tender and delicious. Great barbecue does not need to be hard or complex. If you have great ingredients, barbecuing them to wonderful perfection should be easy and simple. You do not need dozens of ingredients and complex procedures. A few well-chosen ingredients and the right technique can and should result in great barbecue. That is the philosophy that is the soul of Tender Grassfed Barbecue: Traditional, Primal and Paleo. Our ancestors, from all over the world, did not have the time or the inclination to do things the hard and complex way. Over time, they developed many simple ways to barbecue meat that were both easy and delicious. I have adapted some of these methods to modern times, making them even easier. Some of the most wonderful recipes in this book have only four or five ingredients, but the selection and use of those ingredients is crucial. I am convinced that every barbecue should result in great tasting, tender meat. Good is not enough. This book is full of recipes that will give you great-tasting meat—the easy way. Click on this photo to see recipes from Tender Grassfed Barbecue. Why does barbecue taste so good? Barbecue is the oldest method of human cookery, the first way that humans combined meat and fire, and the primal taste of charcoaled meat is deep in our primal memories. The smell of the fire and the roasting meat makes us hungry like no other food, calling to ancestral memories of thousands of wonderful feasts, over the endless years. Over time, humans developed many traditional ways of barbecuing meat, and learned what kind of fire to build, what fuel to use, how to flavor the meat, and how to cook it with fire. The taste of such meat is wonderful to us, because it has been nourishing humankind longer than any other food. Grassfed meat is as close as we can get to the meat our ancestors ate for most of time. Modern meat that is fed an unnatural diet full of chemicals is not the same, and does not taste the same. The methods we have learned in modern times to cook factory meat will ruin grassfed meat. But we can draw on the vast experience our ancestors had in barbecuing grassfed meat, and we can learn from them. That is exactly what I have done in Tender Grassfed Barbecue, studying many old cookbooks and histories to learn how meat was barbecued in the past. I then adapted some of these methods, techniques, and flavorings to come up with a system of barbecuing grassfed meat that results in wonderful barbecue, every time I cook it. In this book, I share much of what I have learned in a way that is both simple and easy-to-use, yet utterly delicious and tender. I have been inspired by many cuisines, both modern and ancient, and everything in-between, and I am grateful to all of them. Grassfed meat is different from factory meat, and should be cooked differently. This is even more true in barbecue than other cooking methods, because charring a grassfed steak over a very hot fire will ruin it. The methods in Tender Grassfed Barbecue are adaptations of traditional methods of barbecue that work beautifully with grassfed meat, bringing out its naturally wonderful flavor and tenderness. The flavor of meat cooked with fire is one of the oldest human flavors, enjoyed over countless thousands of years, stimulating our taste buds in a way no other food ever does. The traditional cooking techniques in Tender Grassfed Barbecue create this primal flavor, using lump hardwood charcoal and hardwood charcoal briquets to awaken the primal taste memories, imbuing the meat with the unforgettable tang of pure wood flavor. Many of the recipes are simply seasoned to bring out the primal flavor of wood and charcoal. Methods for using herbs and wood to provide a deeper smoky flavor are also included. If you liked Tender Grassfed Meat, you will enjoy this book if you barbecue. All the recipes are brand new, as are the techniques and cooking methods. The marinades in this book could be used to cook indoors as well, using the timing for roasts and steaks contained in Tender Grassfed Meat. One major difference is the inclusion of recipes for pastured pork, which was not included in Tender Grassfed Meat. There is also more variety in burgers, including Curry Burger, Cajun Burger, Cherry Bison Burger, and Basil Lamburger. I am very happy to present this book. You will find cooking and barbecuing tips here that are just not available elsewhere. The recipes are easy to prepare, nourishing, and delicious. My family and I have been enjoying the recipes in this book for most of the past two years, whenever the weather allowed barbecuing (and sometimes using the marinades indoors). I hope that you too will enjoy the wonderful flavors and tastes in Tender Grassfed Barbecue. 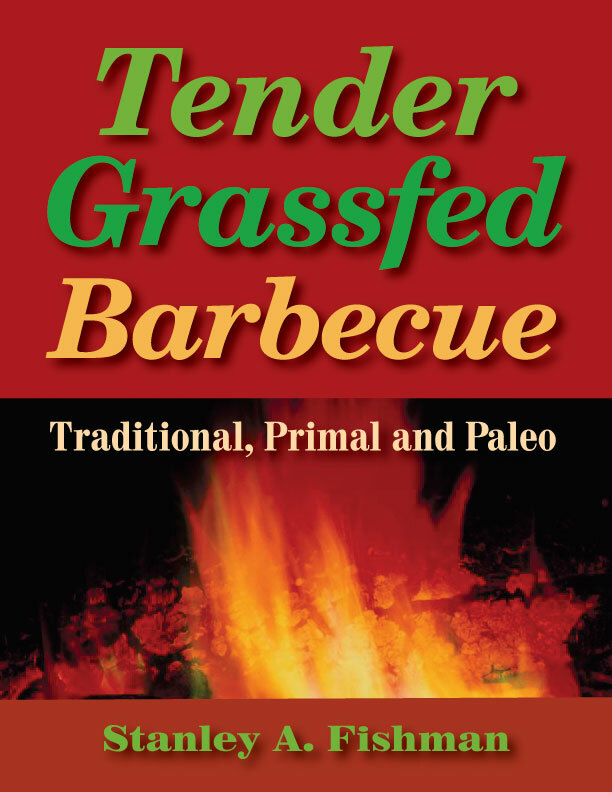 From the author of the classic Tender Grassfed Meat comes Tender Grassfed Barbecue, a great addition to any collection for the traditional, primal or paleo dieter. Before presenting his collection of recipes, Fishman provides a useful chapter on how to barbecue, not by incinerating a piece of meat but by indirect cooking. Then comes a chapter on dietary principles, with plenty of praise for animal fats like tallow and lard. Fishman suggests rubbing meat with lard before cooking, or placing a piece of tallow or suet directly on roasting meat, so it can baste the meat as it cooks. Even though the book highlights recipes for the barbecue, Fishman doesn’t neglect bone broth, which he uses for basting and sauces. Then comes the steak chapter, worth the price of the book alone. In addition to recipes for old favorites like porterhouse and ribeye steaks, the collection includes Portuguese butter steak, Hawaiian steak, Shashlik steak (with Russian flavors), top sirloin steak with Korean flavors, “R&R” steak with Thai flavors, thick Korean steak, and tender shoulder steak in the style of ancient China. Bison, burgers, lamb and pork are all featured. Side dishes are dripping in butter or pork fat. Is your mouth watering? Then head to your barbecue with this book in hand! Thumbs UP. I give a copy of your TGM [Tender Grassfed Meat] book to each new customer who buys grassfed beef from me. My customers truly like receiving your book.